Budget-price, but is the performance up to par? An attractive feature set, appearance and price don't quite compensate for a rather dry sound that lacks some detail and could do with rather more bass control. Enjoyable, but it lacks some finesse. Yamaha's re-entry to the world of Hi-Fi separates has unleashed quite an impressive range of products. 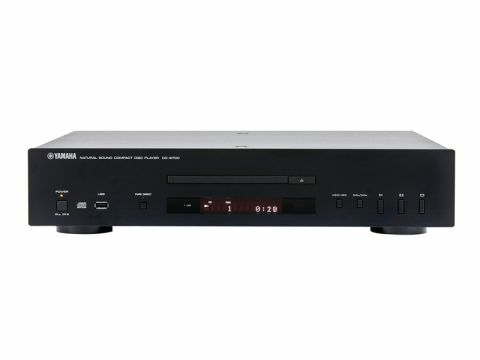 The Yamaha CD-S700 is the cheapest of the single-disc CD players and comes in at an attractive price for what appears to be a well-specified solution. It's a well-built machine, too, and is quite heavy thanks to a reinforced and sturdy case. In order to discourage case resonance, Yamaha has even gone to the trouble of providing a damping layer of metal glued to the underside of the top cover. The front panel is real metal, another nice touch as this price. Upon removing the cover, we found a heavily shielded transport flanked on one side by most of the power supply and on the other by the dedicated audio circuit board: logic circuits are on a separate board at the rear. We say 'most' of the power supply because the audio board has its own supply, fed by a dedicated winding on the mains transformer but rectified, smoothed and regulated locally. Minimalism is the key note as regards audio circuitry, with little more than the DAC chip and a few transistors in evidence – it hardly looks as if there are enough parts to do the job! Component quality is, as one would expect at this price, nothing remarkable, but the DAC is a good quality part. Yamaha has also provided a USB input on the front panel, allowing USB sticks and MP3 players to be plugged-in. The player doesn't seem to recognise uncompressed (WAV) files, but is happy with the usual compressed formats. You will need the remote to switch between CD and USB – we also found the remote more appealing than front-panel buttons for regular operation, as this player responds very slowly to the latter. Listeners who appreciate plentiful bass could find much to admire here. Nothing wrong with good extension, of course, but our listeners did feel that this might be a bit too much of a good thing. It's not so much that bass is over emphasised, but it is not as well controlled as one might wish for and, as a result, has a way of dominating proceedings that isn't quite natural. This remains the case in pretty much any recording though, of course, it is most obvious in those with a 'busy' bottom octave or two. The Mavericks provided a classic example of that within our blind test programme and our listeners found this track rather disappointing, despite the initial attraction of energetic low notes. Higher up the spectrum, treble is extended but a little dry, with less air to it than some. Midrange seems largely neutral, though there's a hint of lift in the lower vocal register. In terms of rhythm and pace, this player is actually quite assured, especially in tracks which are not too extended in frequency range. It was particularly successful with the Otis Redding track, which had our listeners tapping their toes and writing admiring comments about imaging and space around the voice. The trouble is that when a recording is more extended in treble, bass or both, the effects in those registers do detract noticeably from the better performance in the midrange. Detail, too, is a little less clear than most, with varying results depending on the music. In our solo piano example, the complex offbeat rhythms proved rather hard to follow, while the full symphony orchestra lost a good bit of inner detail. Despite all that, this player does manage to provide engaging and enjoyable music under most circumstances and at its very modest price is well worth a listen.